My name is Stephanie Gibson, and I am receiving minister ordination free training at CLI. I live in Lawton, Oklahoma. In my heart and soul, I believe that God has called me to be a light to the lost. I am to help them find their way to Jesus Christ! Therefore, I accepted my call into the ministry in 2016. God has called me to serve him wholeheartedly for the benefit of His kingdom. Through living a godly life, preaching and teaching the word of God, and evangelizing those that are lost, I will live out this calling from God. Since I became a student at Christian Leaders Institute, I have been able to obtain the training I need to be more effective for my ministry journey. I am grateful to CLI for the excellent training which has helped me obtain my Deacon Minister Ordination. 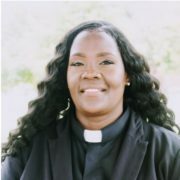 The Deacon Minister Ordination helps me to be recognized as a trained and ordained minister of the gospel of Jesus Christ. Because I took the initiative to complete the Deacon Minister Ordination course with CLI, my Pastor has promoted me to Director of Minister and Elder Educational Training. Christian Leaders Institute played a major part in my promotion. Because of the great training I received from Christian Leaders Institute, I have gained a better understanding of my purpose. The new leadership skills that I obtain will definitely help me in my new position at my church. Thanks to CLI! I plan to educate the ministers and elders at my church about the free training at Christian Leaders Institute. I want them to enroll to learn more and become ordained through CLI as well. Please pray for me to continue to follow the path that God has for me. Blessings! Learn more about minister ordination at Christian Leaders Alliance.